G.V Prakash has been having a ball in the industry at the moment. At a very young age, he has taken up various roles from a singer to a music director to a producer. He ventured into Tamil Cinema as a composer in Veyil and has given us beautiful albums ever since. It should be noted that GVP was used as a singer by AR Rahman for Palakattu Machanukku and Chikku Bukku Raile at a very young age. 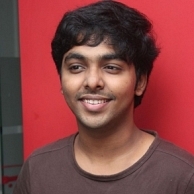 The composer is now enjoying his new role as a producer for Madhayaanai Koottam and GVP is happy with the way the movie is shaping. He will venture soon into his acting endeavours and mentioned that he is listening to stories from a couple of big film makers and that he will take up the new role by next year. It is also said that the composer has been roped in for a Hollywood movie. When quizzed about the same, he reiterated that it is too early to talk about it and that he will let the world know about it as soon as things are confirmed. Madha Gaja Raja release postponed !